The reply-all button can be a brutal leveler, whether you’re a lowly intern or a high-flying CEO. 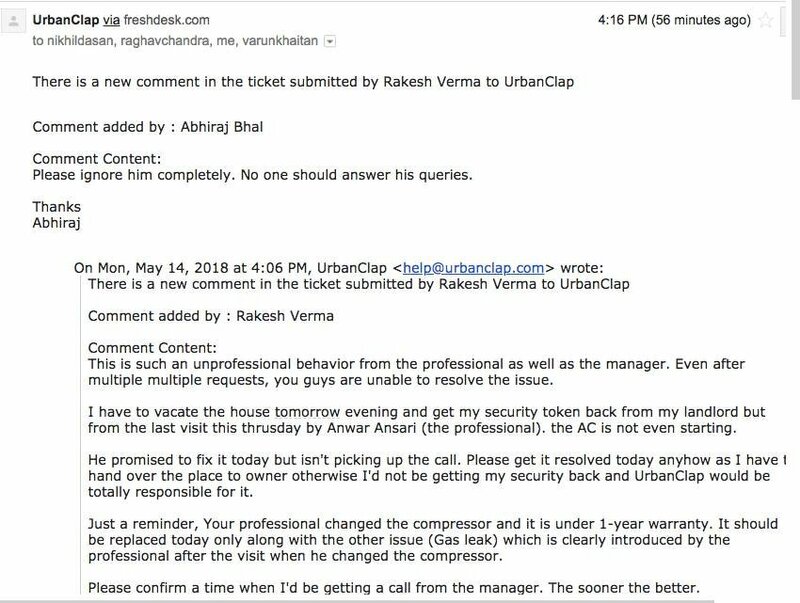 Urban Clap’s CEO Abhiraj Bhal appears to have accidentally hit reply-all on a customer complaint, which meant that his comment, which was presumably meant only for Urban Clap employees, ended up in the inbox of the customer himself. To make matters worse, the comment itself wasn’t flattering — “Please ignore him completely. Nobody should answer his queries,” Bhal had said, telling his support team to stop replying to the customer in question. The entire situation appears to have begun after one Rakesh Verma raised a complaint on UrbanClap, saying that the technician supplied by the company had been unable to fix his AC, and was no longer picking up his calls. The issue, though, wasn’t as simple — Verma and UrbanClap had been emailing each other for months before this particular ticket was raised, and Verma had been accusing Urban Clap of having damaged his AC while repairing it. The back-and-forth had been going on for a while, at which point it caught the attention of the CEO, who asked his team to ignore Verma, but ended up marking him on the mail as well. Predictably, Bhal’s inadvertent reply went viral after it was shared on social media, and garnered 2000 upvotes on Reddit. Bhal has now responded to the original Reddit thread, first apologizing for his reply-all gaffe. ” I must say that it was incorrect for me to have responded this way,” said Bhal. “That was a mistake – and I acknowledge the same.” But Bhal went on to say that Urban Clap had gone “above and beyond” their call of duty in serving Verma, and weren’t at fault. Urban Clap says that they got the AC inspected by their experts and realized that they hadn’t damaged it. In addition, Bhal says that they were willing return the technician charges and pay half the cost of the compressor that had stopped working, but the customer was unwilling to relent. It’s hard to tell what really went on, but at the moment accusations are flying thick and fast between Bhal and Verma. Bhal says that Verma got hold of his number and called him 8 times before the email was sent; Verma says he’d called only twice and says he has call records to prove it. Verma has in turn accused Bhal of calling the CEO of the company he works for and asking him to pressurize him into taking back his complaint. It’s a pretty messy affair, and a customer complaint being dissected in the open is never a good look for a company. And while it might raise questions about how to best handle aggrieved customers, and how to ensure guarantees are maintained in service-oriented business, it also highlights the power of the reply-all button — it looks innocuous, but even the smallest trip up can lead to some pretty dramatic consequences.